Fred writes: Third day on the road today. 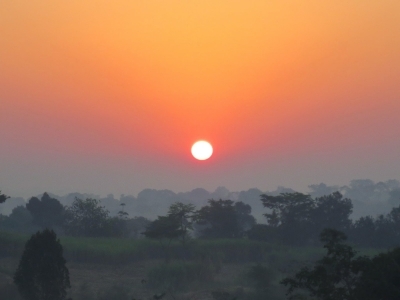 Began with a beautiful sunrise – see below – and then we saddled up and rode about 1-1/2 hr. to our first stop. Really out there but the ride was beautiful. Tim Johnson rode with us, too. We stopped at only eight granny homes today because of the remote locations. We saw some beautiful babies today but were saddened to see that they were all wearing witchcraft bracelets. Even those who convert to Christianity often maintain their previous practices of black magic and ancestor worship. It’s really hard to see that knowing that they will never know the abundant life in Christ unless they can be led away from the old practices. Many of the Christian pastors here are uneducated and preach a gospel that isn’t really the Gospel. More on what The Way Home Africa is working on to help with that later. We saw some beautiful gardens today – we were really impressed at one stop where there are three grannies in immediate proximity to each other and they have teamed up to do some major power-gardening. Many hands make light work. Their gardens produce a very abundant harvest and they not only feed their grandchildren, but also can sell enough excess to pay for all of their school fees. This concept really works when it’s applied and worked hard at. As we visited some gardens that are a few years old it was really neat to see how the soil develops over time using the Farming God’s Way method. The soil here is naturally a gritty red clay. It is not particularly fertile and is even hard on farming implements due to the angular abrasive nature of the grit in it. The Farming God’s Way method of using planting holes instead of tilling the soil, covering the garden with mulch to retain moisture and minimize soil compaction, and returning the spent plants to the soil results in a rich, dark topsoil after only a couple growing seasons. It was very cool to see that the neighbors of the grannies being served by The Way Home Africa / Farming God’s Way partnership are taking notice and beginning to employ the same methods themselves. This is really a game changer for the folks over here. We had a little excitement on the way back this afternoon. The rainy season is moving in and we were doing our best to skirt a big thunderstorm but just a couple miles from home base we were nailed by a pretty nasty hail storm and had to pull off in a small town and take shelter under a canopy with a large group of local men. They looked at us like we’re freaks but nobody bothered us. We often wave to people as we blast down the back roads and they wave back, give us a big grin and yell “mzungu!”. The Ugandan people are very friendly and helpful. Publishers Clearing House in Uganda?? ?